Feeling the spirit of the season? It’s a holiday tradition to decorate the outside of your home for the holiday season, but don’t forget the garage! Things like lights, inflatable lawn characters, wreaths, and bows are often hung on doorways throughout the neighborhood. You can also do this to your garage door when decorating this holiday season! Your garage door is a massive canvas and can be used as the perfect opportunity to be creative and get noticed on your street. Transform your garage door into an enormous Christmas present by wrapping your garage door with holiday paper and putting a large bow on it! Remember the key is to stand out, so the more elaborate, the better! Wreaths may be a classic and festive way to decorate your home, but it can also be used as one of the unique ways to decorate your garage for the holidays, too! Hanging or creating a large wreath over or on your garage door can make for a festive addition to your home’s overall holiday theme. Holiday light projectors have become popular over the last several years, and are a great solution to creatively decorate your garage door. There are many holiday options to choose from and it creates a fun and colored light show that’s sure to wow your neighbors. Framing your garage in holiday lights are about as classic as it gets, but none the less, still effective. Use icicles for overhangs, or sparkler lights, large bulbs, or bright white lights to show that festive spirit. 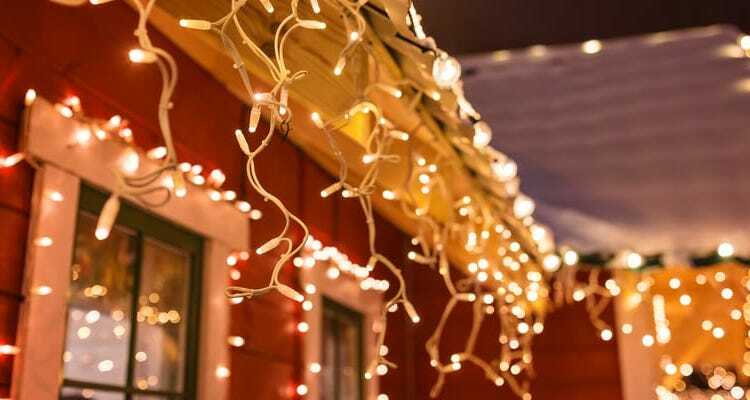 If you want to kick it up a notch, program your lights to music and create a holiday show for neighbors to sing along to. Create a mural on the garage with paper and paints. This is a great way to show your creative side, but you can also find pre-printed holiday scenes both online and at select stores. Garage magnets are a super easy decoration that you can buy for your garage. You can place them wherever you want for a quick and easy holiday decor solution. There are many different options to choose from and range in price. Be sure to check that your decorations don’t interfere with the normal operation of the garage door. You want to clear the space over the garage door so that when it’s raised, you won’t tear the decorations or your door. Make it so that the decorations don’t interfere with the sensors on the garage door. Also, test out your garage door with the decorations in place and make sure the door flows smoothly- you wouldn’t want your garage door to run off track.